Chima Oluigbo, M.D., and his team are using Visualase to identify and eliminate seizure foci and provide patients with a minimally invasive procedure for treating epilepsy. About one in 26 people will be diagnosed with epilepsy in their lifetime. That adds up to about 3.4 million people in the U.S., or about 1 percent of the population nationwide. This condition can have huge consequences on quality of life, affecting whether children will learn well in school, eventually drive a car, hold down a job or even survive into adulthood. For most of those that develop epilepsy, medications can keep seizures in check. 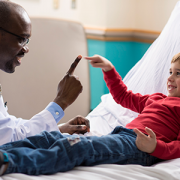 However, for about a third of patients, this strategy doesn’t work, says Chima Oluigbo, M.D., an attending neurosurgeon at Children’s National Health System. That’s when he and his team offer a surgical fix. Epilepsy surgery has come a long way, Dr. Oluigbo explains. When he first began practicing in the early 2000s, most surgeries were open, he says – they involved making a long incision in the scalp that can span half a foot or more. After drilling out a window of skull that can be as long as five inches, surgeons had to dig through healthy brain to find the abnormal tissue and remove it. Each part of this “maximally invasive” procedure can be traumatic on a patient, Dr. Oluigbo says. That leads to significant pain after the procedure, extended hospital stays of at least a week followed by a long recovery. There are also significant risks for neurological complications including stroke, weakness, paralysis, speech problems and more. However, open surgery isn’t the only option for epilepsy surgery anymore. Several new minimally invasive alternatives are now available to patients and the most promising, Dr. Oluigbo says, is called Visualase. He and his team are the only surgeons in the region who perform this procedure. In Visualase surgeries, Dr. Oluigbo and his colleagues start by making a tiny incision, about 5 millimeters, on the scalp. Through this opening, they bore an even tinier hole into the skull and thread a needle inside that’s about 1.6 millimeters wide. “The brain barely notices that it’s there,” he says. The tip of this wire holds a laser. Once this tip is placed directly at the seizure foci – the cluster of nerve cells responsible for generating a seizure – the patient is placed in an intraoperative magnetic resonance imaging (MRI) device. There, after checking the tip’s precise placement, the surgeons turn the laser on. Heat from the laser eradicates the foci, which the surgeons can see in real time using MRI thermography technology. The margins of the destroyed tissue are well-defined, largely sparing healthy tissue. After the wire is removed, the incision is closed with a single stitch, and patients go home the next day. The majority of patients are seizure free, with rates as high as 90 percent for some types of epilepsy, Dr. Oluigbo says. Although seizure-free rates are also high for open procedures, he adds, Visualase spares them many of open surgeries’ painful and difficult consequences. Although open procedures will still be necessary for some patients with particularly large foci that are close to the surface, Dr. Oluigbo says that Visualase is ideal for treating medication-resistant cases in which the foci are buried deep within the brain. A typical example is a condition called hypothalamic hamartoma, in which tumors on the hypothalamus lead to gelastic seizures, an unusual seizure type characterized by uncontrollable laughing. He also uses Visualase for another condition called tuberous sclerosis, in which waxy growths called tubers develop in the brain, and for cancerous and benign brain tumors. It’s gratifying to be able to help these children become seizure-free for the rest of their lives, says Dr. Oluigbo – even more so with the numerous updates he receives from families telling him how much this procedure has improved their children’s lifestyle. The type of hypoxia that occurs with preterm birth is associated with locomotor miscoordination and long-term cerebellar learning deficits but can be partially alleviated with an off-the-shelf medicine, according to a study using a preclinical model. Oxygen deprivation associated with preterm birth leaves telltale signs on the brains of newborns in the form of alterations to cerebellar white matter at the cellular and the physiological levels. Now, an experimental model of this chronic hypoxia reveals that those cellular alterations have behavioral consequences. Chronic sublethal hypoxia is associated with locomotor miscoordination and long-term cerebellar learning deficits in a clinically relevant model of neonatal brain injury, according to a study led by Children’s National Health System researchers published online Aug. 13, 2018, by Nature Communications. Using high-tech optical and physiological methods that allow researchers to turn neurons on and off and an advanced behavioral tool, the research team finds that Purkinje cells fire significantly less often after injury due to perinatal hypoxia. However, an off-the-shelf medicine now used to treat epilepsy enables those specialized brain cells to regain their ability to fire, improving locomotor performance. Step out of the car onto the pavement, hop up to the level of the curb, stride to the entrance, and climb a flight of stairs. Or, play a round of tennis. The cerebellum coordinates such locomotor performance and muscle memory, guiding people of all ages as they adapt to a changing environment. These essential tasks, Gallo says, are coordinated by Purkinje cells, large neurons located in the cerebellum that are elaborately branched like interlocking tree limbs and represent the only source of output for the entire cerebellar cortex. The rate of development of the fetal cerebellum dramatically increases at a time during pregnancy that often coincides with preterm birth, which can delay or disrupt normal brain development. Study authors Aaron Sathyanesan, Ph.D., Joseph Abbah, B.Pharm., Ph.D., Srikanya Kundu, Ph.D. and Vittorio Gallo, Ph.D. The research team leveraged a fully automated, computerized apparatus that looks like a ladder placed on a flat surface, encased in glass, with a darkened box at either end. Both the hypoxic and control groups had training sessions during which they learned how to traverse the horizontal ladder, coaxed out of the darkened room by a gentle puff of air and a light cue. Challenge sessions tested their adaptive cerebellar locomotor learning skills. The pads they strode across were pressure-sensitive and analyzed individual stepping patterns to predict how long it should take each to complete the course. 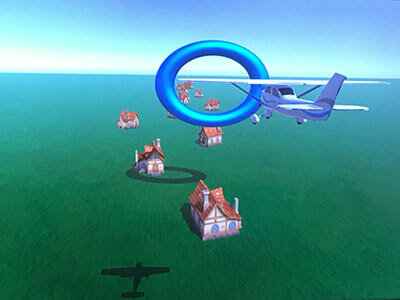 During challenge sessions, obstacles were presented in the course, announced by an audible tone. 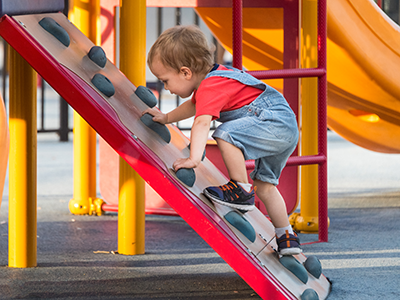 If learning was normal, then the response to the tone paired with the obstacle would be a quick adjustment of movement, without breaking stride, says Aaron Sathyanesan, Ph.D., co-lead author. Experimental models exposed to perinatal hypoxia showed significant deficits in associating that tone with the obstacle. Purkinje cells fire two different kinds of spikes. Simple spikes are a form of constant activity as rhythmic and automatic as a heartbeat. Complex spikes, by contrast, occur less frequently. Sathyanesan and co-authors say that some of the deficits that they observed were due to a reduction in the frequency of simple spiking. Two weeks after experiencing hypoxia, the hypoxic group’s locomotor performance remained significantly worse than the control group, and delays in learning could still be seen five weeks after hypoxia. Gamma-aminobutyric acid (GABA), a neurotransmitter, excites immature neurons before and shortly after birth but soon afterward switches to having an inhibitory effect within in the cerebellum, Sathyanesan says. The research team hypothesizes that reduced levels of excitatory GABA during early development leads to long-term motor problems. Using an off-the-shelf drug to increase GABA levels immediately after hypoxia dramatically improved locomotor performance. 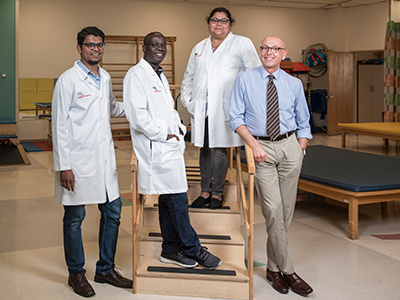 In addition to Gallo and Sathyanesan, Children’s co-authors include Co-Lead Author, Srikanya Kundu, Ph.D., and Joseph Abbah, B.Pharm., Ph.D., both of Children’s Center for Neuroscience Research. Research covered in this story was supported by the Intellectual and Developmental Disability Research Center under award number U54HD090257. Example of NeuroPace RNS System placement. If a child’s refractory seizures – seizures that don’t respond to medication – are originating in a part of the brain that is central to function (for example, impacting memory or verbal skills) the standard next step – surgical resection – is not an option for seizure reduction or relief. In most cases, these children are followed, more medications are tried, and other strategies attempted, but few viable options exist to ease their symptoms. 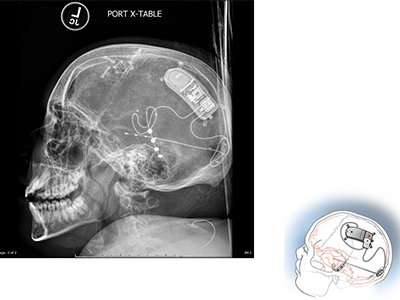 It’s possible that the next generation of implantable neurostimulators, which act as a type of pacemaker for the brain, might make a difference for some children previously left with no answers. 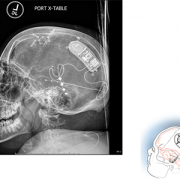 Children’s National neurosurgeon Chima Oluigbo, M.D., in collaboration with the Comprehensive Pediatric Epilepsy Program at Children’s National, is looking at how these devices might be used to reduce or eliminate refractory seizures in pediatric patients. One example of this type of device is the RNS System. The RNS operates differently from previous neuro pacemaker-style devices. It is a “closed-loop” system that doesn’t require external activation once a seizure has started. Instead, the precise location of seizure origination is identified via functional magnetic resonance imaging (fMRI). Leads are then placed at the seizure site via surgery, and once activated, the RNS monitors and self-activates when pre-seizure electrical impulses are detected. The device responds by emitting a series of its own electrical impulses to interrupt and reset the brain’s seizure activity. The RNS system’s ability to continuously monitor the patient also allows physicians to get an inside look at the ongoing brain function of these young patients. De-personalized data from patients who receive the NeuroPace RNS will be shared with the company in the hopes that the data will assist the FDA in assessing the appropriateness of extending the age range of approval from 18 and above to 12 and above. For more than three decades, the world’s pre-eminent scientists and clinicians in pediatric neuro-oncology have convened the International Symposium on Pediatric Neuro-oncology every two years. 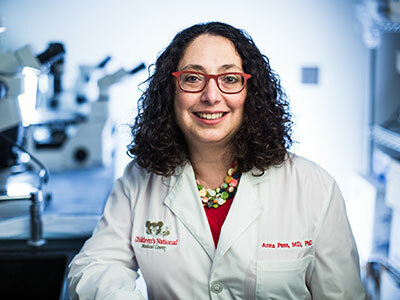 Their goal is to advance the care and treatment of pediatric brain and central nervous system tumors by connecting across disciplines to share research findings and discuss the latest treatment approaches. This year for the first time, representatives from parent advocacy groups and patient support foundations were also invited to attend the traditionally scientific meeting. Their inclusion allowed care providers and scientific investigators to make sure the voices of patients and families, and their needs, are heard. 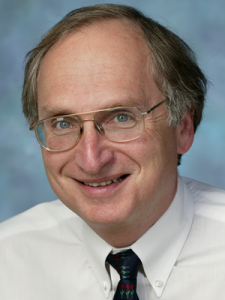 Roger J. Packer, M.D., senior vice president of the Center for Neuroscience and Behavioral Medicine at Children’s National Health System, served as international organizing committee chair this year. He was chair and organizer of the very first symposium, held in 1986, and has led additional sessions over the years. Dr. Packer had the honor of giving the opening keynote address to more than 1,200 participants in Denver this year. He used his lecture to highlight some of the amazing knowledge leaps made in the last decade in understanding the molecular makeup and genetics behind brain and spinal cord tumors. Dr. Packer says progress made in managing and treating childhood low grade gliomas is one example of how care should move forward for other tumor types. 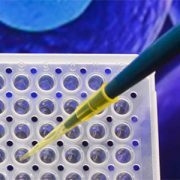 The unique genetic and molecular makeup of low grade gliomas, which are the single most common form of childhood low grade tumor, has allowed clinicians to begin moving away from surgeries, radiation therapy and chemotherapy toward less neurotoxic treatments targeted at the specific molecular properties of the tumor itself. “Although the chemotherapy protocol we began for low-grade gliomas 30 years ago works well and is still the standard of care today, the new molecular approaches we and others have tested will hopefully replace it soon and result in even better outcomes,” he adds. Medulloblastoma, the most common form of malignant brain tumor, is one area Dr. Packer notes could stand to benefit from therapies with less impact on a child’s quality of life. The current treatment protocol used for this childhood tumor also remains the same as the one that Dr. Packer helped develop more than 30 years ago. “We have to move from our decade of discovery to a decade of no excuses where we are able to use what we’ve learned to improve the care of all childhood brain and spinal cord tumors,” he says. Dr. Packer says the key is to avoid getting paralyzed by the mountain of molecular data that is available and really focus on the specific information needed to make treatments more precise. 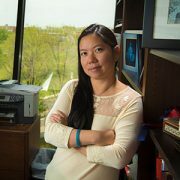 Eugene Hwang, M.D. presented the findings from immunotherapy clinical trials for brain and central nervous system tumors, including diffuse intrinsic pontine glioma (DIPG). Karin Walsh, Psy.D., shared new data demonstrating the reduced neurotoxicity of a new molecularly targeted agent. 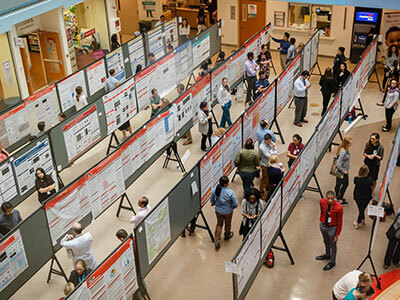 There were also several poster session presentations where Dr. Hwang, Lindsey Kilburn, M.D., Brian Rood, M.D., and others from the Children’s National team shared findings related to the potential and the challenges of molecular targeted therapies, especially immunotherapies. The team at Children’s also presented data related to new findings about how to reverse neurologic and neurocognitive deficits that often result from these conditions, including some that for years were thought to be irreversible, such as vision deficits. In about two to three in every 1,000 full-term births, babies develop a neurological condition called hypoxic ischemic encephalopathy (HIE) when their brains receive insufficient oxygen. HIE can be a devastating condition, leading to severe developmental or cognitive delays or motor impairments that become more evident as the child grows older. Despite improvements in care – including therapeutic hypothermia, a whole-body cooling method administered shortly after birth that can slow brain damage – about half of children with this condition die from neurological complications by age 2. Finding ways to identify children with the most severe HIE could help researchers focus their efforts and provide even more intense neuroprotective care, explains An Massaro, M.D., a neonatologist at Children’s National Health System. But thus far, it’s been unclear which symptoms reflect the extent of HIE-induced brain damage. That’s why Dr. Massaro and colleagues embarked on a study published in the May 2018 issue of Journal of Pediatrics. The team sought to determine whether dysfunction of the autonomic nervous system (ANS) – the auto-pilot part of the nervous system responsible for unconscious bodily functions, such as breathing and digestion – reflected in routine care events can be used as a marker for brain injury severity. The researchers collected data from 25 infants who were treated for HIE with therapeutic hypothermia at Children’s National. 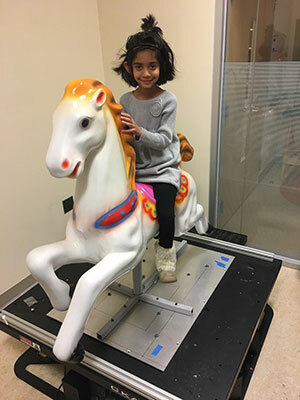 Thanks to multi-modal monitoring, these babies’ medical records hold a treasure trove of information, explains Rathinaswamy B. Govindan, Ph.D., a staff scientist in Children’s Advanced Physiological Signals Processing Lab. 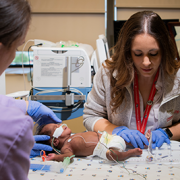 In addition to including continuous heart rate tracings and blood pressure readings that are standard for many infants in the neonatal intensive care unit (NICU), they also recorded cerebral near infrared spectroscopy, a monitor that measures brain tissue oxygen levels. The investigators performed detailed analyses to evaluate how these monitor readings change in response to a variety of routine care events, such as diaper changes, heel sticks, endotracheal tube manipulations and pupil examinations. The researchers stratified these infants based on how dysfunctional their ANS behaved by using heart rate variability as a marker: The fewer natural fluctuations in heart rate, the more damaged their ANS was thought to be. And they also used non-invasive brain magnetic resonance imaging (MRI) to determine brain damage. They then compared this information with the babies’ physiological responses during each care event. Their findings show that infants with impaired ANS, based on depressed heart rate variability before the care event, had significantly different responses to these care events compared with babies with intact ANS. For stimulating interventions, such as diaper changes and heel sticks, both heart rate and blood pressure increased in babies with intact ANS but decreased in babies with impaired ones. Shining a light in their pupils led to an expected decreased heart rate with stable blood pressure in ANS-intact infants, but in ANS-impaired infants, there was no responsive change in heart rate and, additionally, a decrease in blood pressure was observed. Responses were similar between the two groups during breathing tube manipulations, except for a slight increase in heart rate a few minutes later in the ANS-impaired group. These results, Govindan explains, suggest that a real-time, continuous way to assess ANS function may offer insights into the expected physiological response for a given infant during routine NICU care. 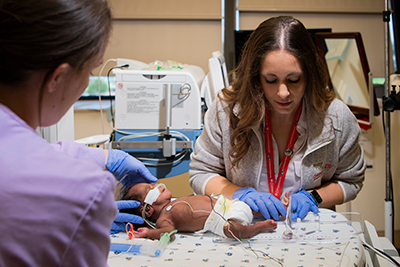 Assessing ANS function in real-time can help guide neuroprotective care in high-risk newborns by providing insight into the evolving nature of brain damage in these infants, Dr. Massaro adds. Beyond simply serving as a biomarker into brain injury, poor ANS function also could contribute to the development of secondary injury in newborns with HIE by stymieing the normal changes in heart rate and blood pressure that help oxygenate and heal injured brains. The researchers found that the cumulative duration of autonomic impairment was significantly correlated with the severity of brain injury visible by MRI in this group of infants. In addition to Dr. Massaro, the Senior Author, study co-authors include Lead Author, Heather Campbell, M.D. ; Rathinaswamy B. Govindan, Ph.D., Children’s Advanced Physiological Signals Processing Lab; Srinivas Kota, Ph.D.; Tareq Al-Shargabi, M.S. ; Marina Metzler, B.S. ; Nickie Andescavage, M.D., Children’s neonatalogist; Taeun Chang, M.D., Children’s neonatal and fetal neurologist; L. Gilbert Vezina, M.D., attending in Children’s Division of Diagnostic Imaging and Radiology; and Adré J. du Plessis, M.B.Ch.B., M.P.H., chief of Children’s Division of Fetal and Transitional Medicine. 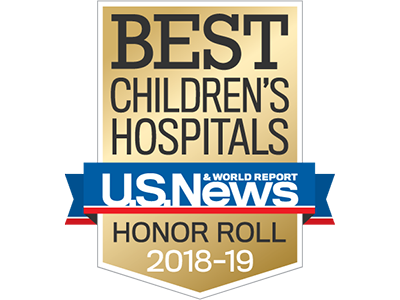 This research was supported by the Clinical and Translational Science Institute at Children’s National under awards UL1TR000075 and 1KL2RR031987-01 and the Intellectual and Developmental Disabilities Research Consortium within the National Institutes of Health under award P30HD040677. 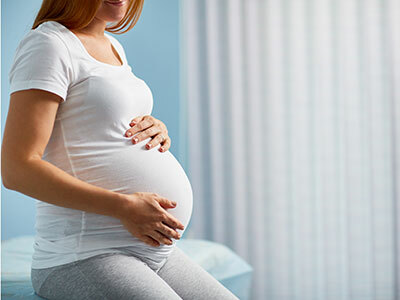 Ongoing placental dysfunction and allopregnanolone loss, not the increase that was expected due to stress, may alter cortical development in complicated pregnancies and put babies at risk, says Anna Penn, M.D., Ph.D. Researchers long have known that allopregnanolone (ALLO), a derivative of the hormone progesterone, is produced in adults’ brains during times of acute stress and modulates how easily the brain’s neurons fire. ALLO also is produced in the placenta during fetal development, one of more than 200 different hormones that each uniquely contribute to fostering a smooth pregnancy and maintaining a fetus’ overall health. Although ALLO is thought to protect the developing brain in pregnancies complicated by conditions that might harm it, such as high blood pressure, how its levels evolve during pregnancy and in newborns shortly after birth has remained unknown. Now, a new study presented during the Pediatric Academic Societies (PAS) 2018 annual meeting suggests that the placenta ramps up ALLO production over the second trimester, peaking just as fetuses approach full term. 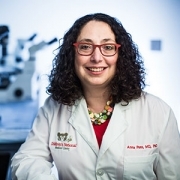 To investigate this phenomenon, Anna Penn, M.D., Ph.D., a neonatologist/neuroscientist at Children’s National Health System, and colleagues created a designer experimental model to study how premature loss of ALLO alters orderly brain development. Knowing more about the interplay between ALLO and normal development of the cortex, the outer layer of the cerebrum, is a first step that could lead to strategies to rescue this vital brain region. To better understand the human placental hormone pattern, the research team analyzed cord blood or serum samples collected within the first 36 hours of life for 61 preterm newborns born between 24 to 36 gestational weeks. They compared those preemie samples with samples drawn from 61 newborns carried to term who were matched by race, gender, size for gestational age, delivery method and maternal demographics. They used liquid-chromatography-tandem mass spectrometry, a technique that can precisely analyze trace levels of compounds, to compare levels of 27 different steroids, including ALLO and its precursors as well as better-known adrenal gland hormones, such as cortisol and 17-Hydroxyprogesterone. In addition to Dr. Penn, study co-authors include Caitlin Drumm, MedStar Georgetown University Hospital; Sameer Desale, MedStar Health Research Institute; and Kathi Huddleston, Benjamin Solomon and John Niederhuber, Inova Translational Medicine Institute. 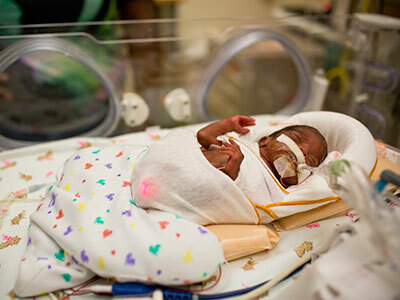 Babies born prematurely – before 37 weeks of pregnancy – often have a lot of catching up to do. Not just in size. 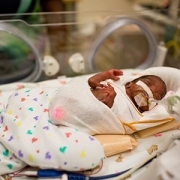 Preterm infants typically lag behind their term peers in a variety of areas as they grow up, including motor development, behavior and school performance. New research suggests one way to combat this problem. 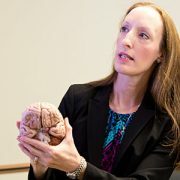 The study, led by Children’s researchers and presented during the Pediatric Academic Societies 2018 annual meeting, suggests that the volume of carbohydrates, proteins, lipids and calories consumed by very vulnerable premature infants significantly contributes to increased brain volume and white matter development, even though additional research is needed to determine specific nutritional approaches that best support these infants’ developing brains. During the final weeks of pregnancy, the fetal brain undergoes an unprecedented growth spurt, dramatically increasing in volume as well as structural complexity as the fetus approaches full term. One in 10 infants born in the U.S. in 2016 was born before 37 weeks of gestation, according to the Centers for Disease Control and Prevention. 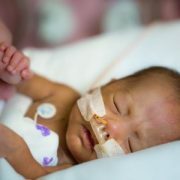 Within this group, very low birthweight preemies are at significant risk for growth failure and neurocognitive impairment. Nutritional support in the neonatal intensive care unit (NICU) helps to encourage optimal brain development among preterm infants. However, their brain growth rates still lag behind those seen in full-term newborns. The research team at Children’s National Health System enrolled 69 infants who were born younger than 32 gestational weeks and weighed less than 1,500 grams. The infants’ mean birth weight was 970 grams and their mean gestational age at birth was 27.6 weeks. The newborns underwent MRI at their term-equivalent age, 40 weeks gestation. Parametric maps were generated for fractional anisotropy in regions of the cerebrum and cerebellum for diffusion tensor imaging analyses, which measures brain connectivity and white matter tract integrity. The research team also tracked nutritional data: Grams per kilogram of carbohydrates, proteins, lipids and overall caloric intake. Because the nutritional support does contribute to cerebral volumes and white matter microstructural development in very vulnerable newborns, Limperopoulos says the significant negative associations seen in this study may reflect the longer period of time these infants relied on nutritional support in the NICU. In addition to Ottolini and Limperopoulos, study co-authors include Nickie Andescavage, M.D., Attending, Children’s Neonatal-Perinatal Medicine; and Kushal Kapse. Researchers have discovered that treating premature infants with erythropoietin can help protect and repair their vulnerable brains. The drug erythropoietin (EPO) has a long history. First used more than three decades ago to treat anemia, it’s now a mainstay for treating several types of this blood-depleting disorder, including anemia caused by chronic kidney disease, myelodysplasia and cancer chemotherapy. More recently, researchers discovered a new use for this old drug: Treating premature infants to protect and repair their vulnerable brains. However, how EPO accomplishes this feat has remained unknown. 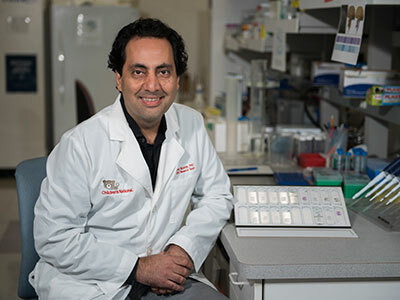 New genetic analyses presented at the Pediatric Academic Societies 2018 annual meeting that was conducted by a multi-institutional team that includes researchers from Children’s National show that this drug may work its neuroprotective magic by modifying genes essential for regulating growth and development of nervous tissue as well as genes that respond to inflammation and hypoxia. The research team investigated whether micro-preemies treated with EPO had distinct DNA methylation profiles and related changes in expression of genes that regulate how the body responds to such environmental stressors as inflammation, hypoxia and oxidative stress. They also investigated changes in genes involved in glial differentiation and myelination, production of an insulating layer essential for a properly functioning nervous system. 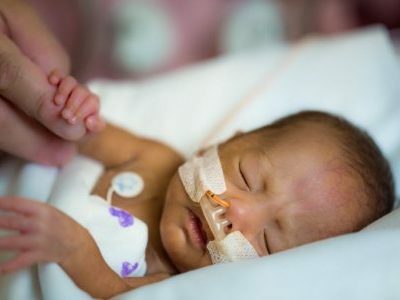 The genetic analyses are an offshoot of a large, randomized clinical trial of EPO to treat preterm infants born between 24 and 27 gestational weeks. The DNA of 18 newborns enrolled in the clinical trial was isolated from specimens drawn within 24 hours of birth and at day 14 of life. Eleven newborns were treated with EPO; a seven-infant control group received placebo. Mitogen-activated protein kinase 8 interacting protein 2, encodes a scaffolding protein broadly expressed in the brain. Experimental models that lack this protein display autistic tendencies. Major histocompatibility complex, class II, DR alpha, a central player in proper immune system function. “These findings suggest that EPO’s neuroprotective effect may be mediated by epigenetic regulation of genes involved in the development of the nervous system and that play pivotal roles in how the body responds to inflammation and hypoxia,” Dr. Massaro says. 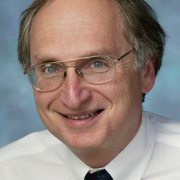 In addition to Dr. Massaro, study co-authors include Theo K. Bammler, James W. MacDonald, biostatistician, Bryan Comstock, senior research scientist, and Sandra “Sunny” Juul, M.D., Ph.D., study principal investigator, all of University of Washington. 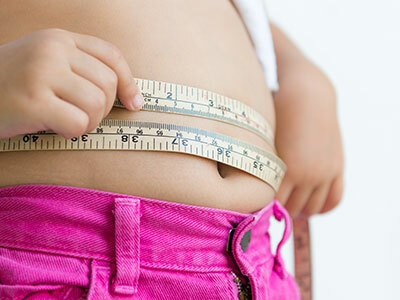 Faculty from Children’s National Health System’s Department of Psychology & Behavioral Health set out to learn if any demographic, psychiatric, or cognitive factors play a role in determining if an adolescent should be eligible for bariatric surgery, and what their weight loss outcomes might be. Presenting at the Society for Pediatric Psychology Annual Conference earlier this month, a group of researchers, fellows and clinicians, including surgeons from Children’s National showcased their findings. One of the posters developed by Meredith Rose, LGSW, ML, who works as an interventionist on a Children’s National clinical research team, received special recognition in the Obesity Special Interest Group category. 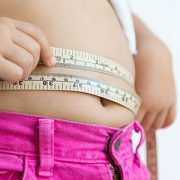 One presentation reported on a total of 222 pediatric patients with severe obesity, which is defined as 120 percent of the 95th percentile for Body Mass Index. Mean age of the participants was 16 years of age, 71 percent were female and 80 percent where Hispanic or non-White. As part of their preparation for surgery, all patients were required to complete a pre-bariatric surgery psychological evaluation, including a clinical interview and Schedule for Affective Disorders and Schizophrenia (KSADS-PL) screening. The studies by the Children’s teams were based on a medical record review of the pre-screening information. Adolescents being evaluated for surgery had high rates of mental health diagnoses, particularly anxiety and depression, but also included Attention Deficit Hyperactivity Disorder, eating disorders, and intellectual disability. Another Children’s presentation at the conference looked at weight loss outcomes for adolescents based on IQ and intellectual disability. Overall, neither Full Scale IQ from the Wechsler Abbreviated Intelligence Scale – 2nd edition, nor the presence of an intellectual disability predicted weight loss following surgery. 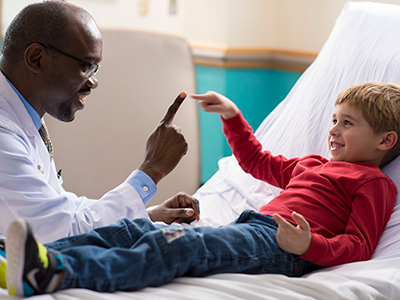 “The sum of our research found that kids do really well with surgery,” said Eleanor Mackey, PhD, assistant professor of psychology and behavioral health. “Adolescents, regardless of the presence of intellectual disability areas are likely to lose a significant amount of weight following surgery,” added Dr. Mackey. The research team concluded that examining how individual factors, such as intellectual disability, psychiatric diagnoses, and demographic factors are associated with the surgery process is essential to ensuring adequate and empirically supported guidelines for referral for, and provision of bariatric surgery in adolescents. Next steps by the team will include looking into additional indicators of health improvement, like glucose tolerance, quality of life, or other lab values, to continue evaluating the benefits of surgery for this population. 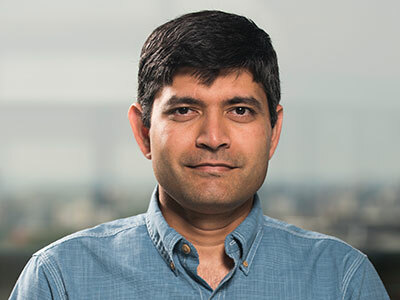 “A more complete understanding of the diagnostic and prognostic importance of GABA and glutamate in the preterm brain will help us to direct treatment strategies for the most vulnerable preterm infants at risk of brain injury,” says Sudeepta K. Basu, M.D. The major neurotransmitters gamma-aminobutyric acid (GABA) and glutamate are pivotal to fetal and newborn brain development and influence evolution of brain injury and repair following preterm birth. Magnetic resonance spectroscopy (MRS) enables in vivo measurement of brain metabolites. However, GABA and glutamate are found in the developing brain in low concentrations, and their weak signal can be swamped by the stronger signal of more dominant metabolites. A Children’s research team reports findings from a pilot study utilizing an innovative technique of MRS to reliably measure in vivo GABA in the developing preterm brain. 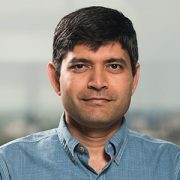 The groundbreaking research done by the team that includes Principal Investigator Sudeepta K. Basu, M.D., neonatology attending at Children’s National Health System, is very unique and original since there are no existing data of in vivo GABA concentrations in the developing cerebellum. Under the mentorship of Catherine Limperopoulos, Ph.D., director of Children’s Developing Brain Research Laboratory, the team of multi-disciplinary specialists is pursuing cutting-edge technologies in advanced MRI neuroimaging to explore brain development and injury in preterm infants. The research, presented at the Eastern Society for Pediatric Research (ESPR) annual meeting by Dr. Basu, was honored with the “2018 Meritorious Poster Award.” The research titled “Distinct temporal trends of GABA and glutamate in the cerebellum and frontal cortex of preterm infants” reports, for the first time, positive temporal trends in the specific regions of the developing brain intricately involved in cognitive and motor functions. This work lays the foundation for developing novel ways to diagnose, monitor and investigative brain protective therapies for vulnerable prematurely born infants. The Children’s team performed non-sedated MRS in 44 preterm infants whose mean gestational age at birth was 26.5 weeks, placing voxels at the middle of the cerebellum and the right frontal cortex. GABA and GIx (glutamate combined with glutamine) were positively correlated with post-menstrual age in the frontal cortex, but not the cerebellum. At the ESPR meeting, the team also presented for the first time that caffeine, a neuroprotective agent in preemies, leads to increased in vivo GABA concentration in the developing frontal cortex. “Caffeine increases GABA/Cr ratio in frontal cortex of preterm infants on spectroscopy.” Aditi Gupta; Sudeepta K. Basu, M.D. ; Mariam Said, M.D. ; Subechhya Pradhan, Linda White; Kushal Kapse; Jonathan Murnick, M.D., Ph.D.; Taeun Chang, M.D. ; and Catherine Limperopoulos, Ph.D.
“Impact of early nutrition on microstructural brain development in VLBW Infants.” Katherine M. Ottolini, Nickie Andescavage, M.D. ; Kushal Kapse; and Catherine Limperopoulos, Ph.D.
“Direct measurement of neonatal cardiac output utilizing the CO status monitor.” Simranjeet S. Sran, Mariam Said, M.D. ; and Khodayar Rais-Bahrami, M.D. “Cerebro-cerebellar diaschisis in preterm infants following unilateral cerebral parenchymal injury.” Huma Mirza, Yao Wu, Kushal Kapse, Jonathan Murnick, M.D., Ph.D.; Taeun Chang, M.D. ; and Catherine Limperopoulos, Ph.D. Researchers nationally and internally stand the best chance of fulfilling Gabriella Miller’s dream of curing childhood cancers by effectively working together, says Javad Nazarian, Ph.D.
“Thank you for helping me reach my goal.” The handwritten note was penned by Gabriella Miller, a patient treated at Children’s National Health System who ultimately succumbed to an aggressive form of pediatric brain cancer. Gabriella, then 9 years old, dreamed of curing childhood cancer, including diffuse intrinsic pontine glioma (DIPG), the aggressive pediatric brain tumor that took her life. Attendees will gather April 14, 2018, for an annual gala held by the Smashing Walnuts Foundation – a group Gabriella started – to celebrate their progress on achieving her goal and to chart future strategic approaches. “While this foundation was the brainchild of a single person, researchers nationally and internally stand the best chance of fulfilling her dream by working together more effectively,” says Javad Nazarian, Ph.D., M.S.C., the gala’s main speaker. 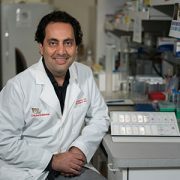 Nazarian is scientific director of Children’s Brain Tumor Institute and is scientific co-chair of the Children’s Brain Tumor Tissue Consortium. To that end, Children’s National was named a member of a public-private research collective awarded up to $14.8 million by the National Institutes of Health (NIH) to launch a data resource center that cancer sleuths around the world can tap into to accelerate discovery of novel treatments for childhood tumors. This April, the NIH announced that researchers it funded had completed PanCancer Atlas, a detailed genomic analysis on a data set of molecular and clinical information from more than 10,000 tumors representing 33 types of cancer, including DIPG. And this January, the NIH announced that it would accept applications from researchers performing whole-genome sequencing studies at one of its Gabriella Miller Kids First research program sequencing facilities. The centers will produce genome, exome and transcriptome sequencing. Expanding access to these growing troves of data requires a close eye on nuts-and-bolts issues, such as securing sufficient physical data storage space to house the data, Nazarian adds. It’s essential for research teams around the world to have streamlined access to data sets they can analyze as well as contribute to. “In addition to facilitating researchers’ access to this compiled data, we want to ensure that patients and families feel they are partners in this enterprise by also offering opportunities for them to share meaningful clinical data,” Nazarian says. 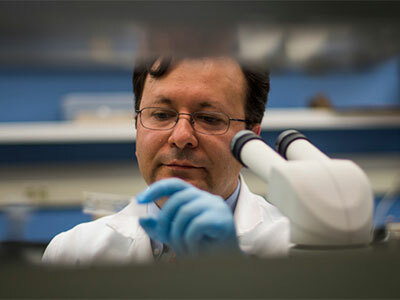 Nazarian has been instrumental in expanding the comprehensive biorepository at Children’s National, growing it from just a dozen samples six years ago to thousands of specimens donated by patients with all types of pediatric brain tumors, including DIPG. Pediatric ophthalmology celebrates 75th anniversary in Washington, D.C.
Angeline M. Parks Visiting Professor Sean P. Donahue, M.D., Ph.D., (front left) enjoys a light moment during the celebration of the 75th anniversary while Anthony Sandler, M.D., Children’s surgeon in chief, senior vice president of the Joseph E. Robert Jr. Center for Surgical Care and director of the Sheikh Zayed Institute, speaks to the group. 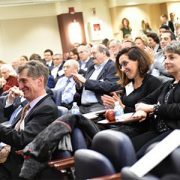 After 75 years dedicated to the eyes of children, the world’s pediatric ophthalmologists gathered in Washington, D.C., the specialty’s birthplace, to share the latest research and innovation in the field. The group gathered for a joint meeting of the International Strabismological Association (ISA) and the American Association for Pediatric Ophthalmology and Strabismus (AAPOS), which was held March 18-22, 2018. In advance of the larger meeting, Children’s Division of Ophthalmology welcomed some of the international attendees to Children’s National for a special gathering on Saturday, March 17, 2018. The event at Children’s featured a special lecture by this year’s Angeline M. Parks Visiting Professor, Sean P. Donahue, M.D., Ph.D. Dr. Donahue is the Sam and Darthea Coleman Chair in Pediatric Ophthalmology and Chief of Pediatric Ophthalmology at the Children’s Hospital at Vanderbilt. 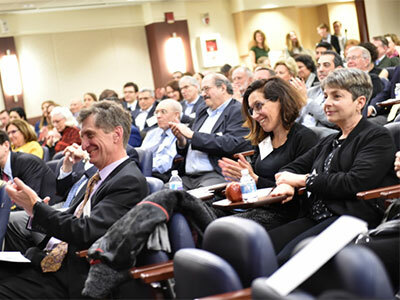 This Annual Visiting Professorship was established by the members of the Costenbader Society (The Children’s National Pediatric Ophthalmology Alumni Society) in memory of Angeline M. Parks, the wife of pediatric ophthalmologist Marshall M. Parks, M.D., to carry on her legacy of establishing a warm and supportive environment between physician and spouse, which benefits the physicians and their young patients. Three former division chiefs of Ophthalmology at Children’s National, Drs. Costenbader, Parks and Friendly, have national lectureships established in their names to reflect their contributions to the field. Dr. Frank Costenbader, the society’s namesake, established the sub-specialty of pediatric ophthalmology. Dr. Parks founded the Children’s Eye Foundation and the AAPOS, and David S. Friendly, M.D., codified pediatric ophthalmology fellowship training across the United States. During the ISA-AAPOS meeting, two current Children’s National pediatric ophthalmologists were recognized with Honor Awards for their long-term dedication to pediatric ophthalmology, their patients, and their engagement in the AAPOS to advance the field. Chair of the organization’s audit committee and the Costenbader Lecture selection committee. Membership on the fellowship directors’ committee that developed nationwide requirements for pediatric ophthalmology fellowships and established the certification process to insure high quality and uniform education in the specialty. Invited lectures in Shanghai, China; Geneva, Switzerland; and Sao Paolo, Brazil, among others. Many posters and presentations about clinical and research topics of importance for members of the AAPOS and other distinguished professional societies. Multiple memberships on vital committees, including AAPOS’s training and accreditation committee and audit committee. 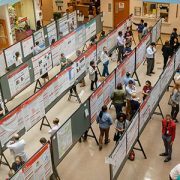 Presentation of original research via posters and oral presentations on topics including best practices in neonatal clinical care, innovative tools and applications and advocacy for patients and their families. https://innovationdistrict.childrensnational.org/wp-content/uploads/2018/04/Sean-Donahue.jpg 300 400 Innovation District https://innovationdistrict.childrensnational.org/wp-content/uploads/2018/11/idlogo1-tagline-Advances-in-Medicine.gif Innovation District2018-04-05 16:08:222018-04-05 16:14:02Pediatric ophthalmology celebrates 75th anniversary in Washington, D.C.
“Imaging is constantly helping us make new discoveries with this virus, and in these two cases we found things that had not been previously described,” says Sarah Mulkey, M.D., Ph.D. Magnetic resonance imaging (MRI) has identified two brain abnormalities never before reported in newborns with prenatal exposure to the Zika virus. Children’s National Health System researchers reported these findings from a study of more than 70 fetuses or newborns with Zika exposure in utero. The study was published in the January 2018 edition of Pediatric Neurology. The two novel defects – cranial nerve enhancement and cerebral infarction – may join the growing list of neurological findings associated with congenital Zika infection. 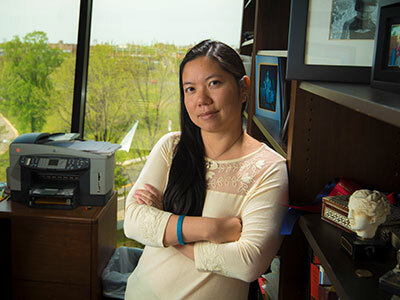 “Imaging is constantly helping us make new discoveries with this virus, and in these two cases we found things that had not been previously described,” says Sarah Mulkey, M.D., Ph.D., the study’s lead author and a fetal-neonatal neurologist at Children’s National. Dr. Mulkey works in Children’s Congenital Zika Virus Program, one of the nation’s first comprehensive, dedicated Zika programs. The research team recommends that postnatal brain MRI be considered in addition to ultrasound for newborns exposed to Zika in utero. 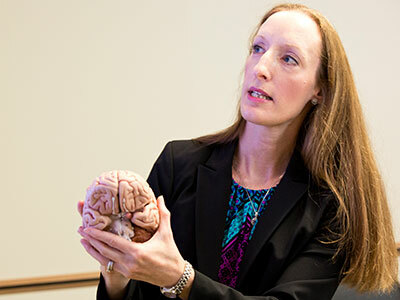 “Brain MRI can be performed in the newborn often without sedation and provides an opportunity to look for brain abnormalities we might not catch otherwise – or might not detect until much later,” says Dr. Mulkey. Birth defects are seen in 6 to 11 percent of pregnancies affected by Zika, and some of the neurological complications in infants are not apparent until well after birth. Of the two infants in which the new abnormalities were observed, both had normal head size at birth. Neither had smaller-than-normal head size (microcephaly), one of the more severe effects associated with congenital Zika syndrome. The research team acknowledges that the clinical significance of this finding is not yet known. In the second patient, brain MRI conducted without contrast at 16 days of age revealed a small area consistent with chronic infarction (ischemic stroke) that likely occurred during the third trimester. In both patients, neonatal brain MRI identified subclinical findings that had not previously been described as part of congenital Zika syndrome. As the body of evidence about the Zika virus has grown, the spectrum of associated brain abnormalities has expanded to include considerably more findings than isolated microcephaly. Data gathered in 2017 from the Centers for Disease Control and Prevention’s Zika pregnancy and infant registry indicates that 25 percent of eligible U.S. infants receive recommended postnatal imaging. Dr. Mulkey said this represents many possible missed opportunities for earlier identification of brain abnormalities. 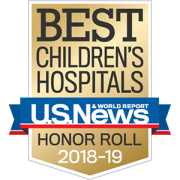 In addition to Dr. Mulkey, Children’s co-authors include L. Gilbert Vezina, M.D., Neuroradiology Program director; Dorothy I. Bulas, M.D., chief of Diagnostic Imaging and Radiology; Zarir Khademian, M.D., radiologist; Anna Blask, M.D., radiologist; Youssef A. Kousa, M.S., D.O., Ph.D., child neurology fellow; Lindsay Pesacreta, FNP; Adré J. du Plessis, M.B.Ch.B., M.P.H., Fetal Medicine Institute director; and Roberta L. DeBiasi, M.D., M.S., senior author and Pediatric Infectious Disease division chief; and Caitlin Cristante, B.S. Financial support for this research was provided by the Thrasher Research Fund. One of the latest developments in oncology treatments is the advancement of molecularly targeted therapeutic agents. These drugs can be used to specifically target and impact the signaling pathways that encourage tumor growth, and are also becoming a common go to for ophthalmologists to treat retinopathy of prematurity in neonates. 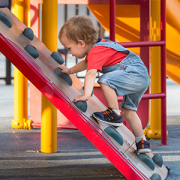 But in the developing brain of a child or adolescent, these pathways are also crucial to the growth and development of the brain and central nervous system. 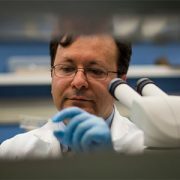 “These drugs have been tested in vitro, or in tumor cells, or even in adult studies for efficacy, but there was no data on what happens when these pathways are inhibited during periods when their activation is also playing a key role in the development of cognitive and behavioral skills, as is the case in a growing child,” says Joseph Scafidi, D. O., M.S., a neuroscientist and pediatric neurologist who specializes in neonatology at Children’s National Health System. As it turns out, when the drugs successfully inhibit tumor growth by suppressing receptors, they can also significantly impact the function of immature brains, specifically changing cognitive and behavioral functions that are associated with white matter and hippocampal development. 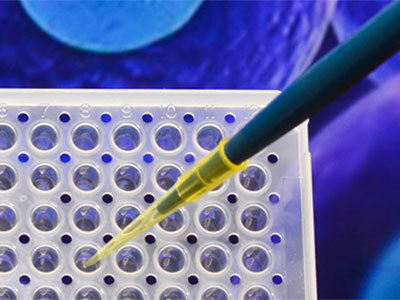 The results appeared in Cancer Research, and are the first to demonstrate the vulnerability of the developing brain when this class of drugs is administered. The pre-clinical study looked at the unique impacts of drugs including gefitinib (Iressa), sunitib malate (Sutent) and rapamycin (Sirolimus) that target specific pathways responsible for the rapid growth and development that occurs throughout childhood. The agents alter signaling pathways in the developing brain, including decreasing the number of oligodendrocytes, which alters white matter growth. 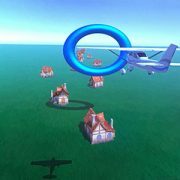 Additionally, the agents also impact the function of specific cells within the hippocampus related to learning and memory. When younger preclinical subjects were treated, impacts of exposure were more significant. Tests on the youngest pre-clinical subjects showed significantly diminished capacity to complete cognitive and behavioral tasks and somewhat older, e.g. adolescent, subjects showed somewhat fewer deficits. Adult subjects saw little or no deficit. Researchers also found measurable improvements in these impaired cognitive and behavioral functions when rehabilitation strategies such as environmental stimulation, cognitive therapy and physical activity were applied after drug exposure. Many major pediatric oncology centers, including the Center for Cancer and Blood Disorders at Children’s National, already incorporate rehabilitation strategies such as cognitive therapy and increased physical activity to help pediatric patients return to normal life following treatment. The results from this study suggest that these activities after treatment for pediatric brain tumors may play a vital role in improving recovery of brain cognitive and behavioral function in the pediatric population. This research was funded by grants to Dr. Scafidi from the National Brain Tumor Society, Childhood Brain Tumor Foundation and the National Institutes of Health.